We try and keep our poker reviews as short but informational as possible. So expect our Black Chip Poker review to be the same. This is the only paragraph in the article that isn’t used to pass on information, but this is the introduction to our poker reviews and we had to let you know how awesome our quick fire Poker Reviews are. Our Black Chip Poker review will without all the usual promotional text you find in poker site reviews. Expect simple informational without the fluff. Now onto our BCP Review. Black Chip Poker is a decent choice of poker room if you are from the USA. It is on the Winning Poker Network, so shares traffic with sites like Americas Cardroom and Ya Poker. BCP is estimated to be the 2nd largest site on the network, which would suggest it has a slightly better than average amount of traffic. BCP offer 100% deposit bonus up to $1000 which is also better than industry standard. In summary, we have no problem recommending poker players to Black Chip Poker, but would suggest Americas Cardroom as a slightly better option. Whats New at Black Chip Poker? Black Chip Poker have recently added promo called “Freerolls on Demand” which is actually a pretty cool promo if you are a novice player or struggling with your bankroll. The work similar to a standard Sit’n’Go: when 270 players are registered the freeroll starts. So you can possible find a freeroll running at Black Chip Poker 24hrs a day, 7 days a week. BCP have a better than standard deposit bonus. The days of crazy 1st deposit bonuses are no longer. So to find a poker site offering more than a few hundred $ to sign up is pretty rare now. However, BCP still offers a 100% bonus up to $1000 on first deposits. To be honest, promotions is one of the strong points of Black Chip Poker and the winning poker network, and if I was to go into detail on all the promotions currently running at Black Chip Poker I would be hear for a while which would take away from the points of a quick review. So I will mention a few here: Million Dollar Sundays, Saturday Super Series, Streak Tournaments, Sit and Crush, Jackpot Poker and The Live Cage. If you want information on all the promotions currently running at BCP or more details on the promotions at BCP we suggest you check out there Promos page. Black Chip Poker have a few available downloads. They offer poker downloads for Windows and Mac, and to be honest I couldn’t find information on Android or iPhone downloads. I use the Mac version and its pretty easy to download. BlackChipPoker is easy to download, as you don’t have to pick which download you need, as it does that for you. So the easiest way to download Black Chip Poker is to click the Download Now in bold below, which will take you to BlackChipPoker.eu. You will then see a red button on the top right that says “Download Now”. Click that and the Black Chip Poker download will start. Once downloaded, you can launch if from your applications to start playing BCP. Currently BlackChipPoker don’t offer a mobile app. We expect this to change as mobile poker is such a large market and BCP will surely be losing money without having one. 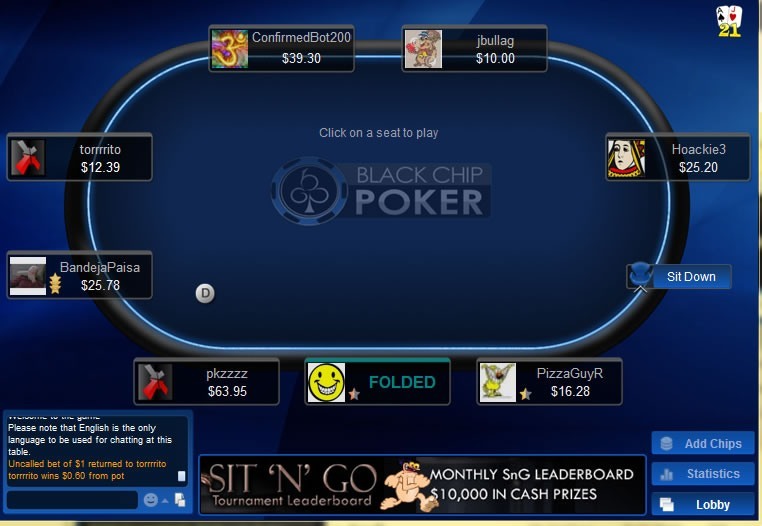 We expect to be updating this section with news of a mobile app at Black Chip Poker soon. BlackChipPoker.eu use the same software as the some of the Winning Poker Network. Americas Cardroom and YaPoker are a few of the poker sites that use the same poker software as BCP. So you can guess its going to be fairly decent when it is share by some solid poker sites like the two mentioned. One of the big let downs though is the lack of a mobile app which is important in todays age. Other than that, the Software is fairly solid, very usable with a couple nice features. Black Chip Poker has more Crypto Currency options to deposit and withdraw than any other online poker site. In total BCP currently has 60 Cryptocurrency options, ranging from Bitcoin to OmisGo. BlackChipPoker are apart of the US friendly Winning Poker Network. The WPN is the 9th largest network and 2nd largest US friendly network, with only Bodog’s PiaWangLuo being a busier US network. The WPN has solid sites like Americas Cardroom and YaPoker to help keep poker players grinding on the network. On average the WPN will have over 1000 players at any time and can touch near 2000 players at peak times.